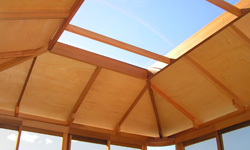 Western Red Cedar wood is often used for roofing material on luxury homes in Canada. Western Red Cedar is hygroscopic and will absorb or discharge moisture to attain equilibrium with the surrounding atmosphere. It has a very low shrinkage factor and is superior to all other coniferous woods in its resistance to warping, twisting, and checking. Western Red Cedar has low density enhancing its insulation value and is particularly effective to reduce noise or to confine noise to certain areas. 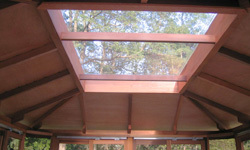 Furthermore, Western Red Cedar contains natural oils that act as preservatives to help the wood resist decay. Properly finished and maintained, Western Red Cedar will deliver decades of trouble-free service. 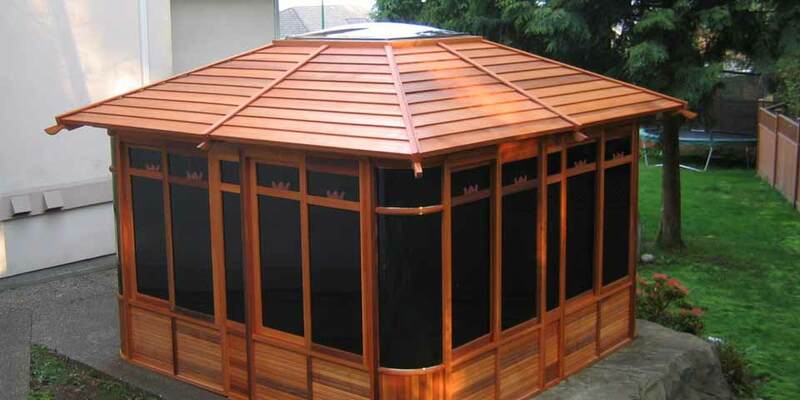 The Canadian Western Red Cedar Wood Roof is available on the Royal Gazebo Collection and the Laguna Beach Collection. 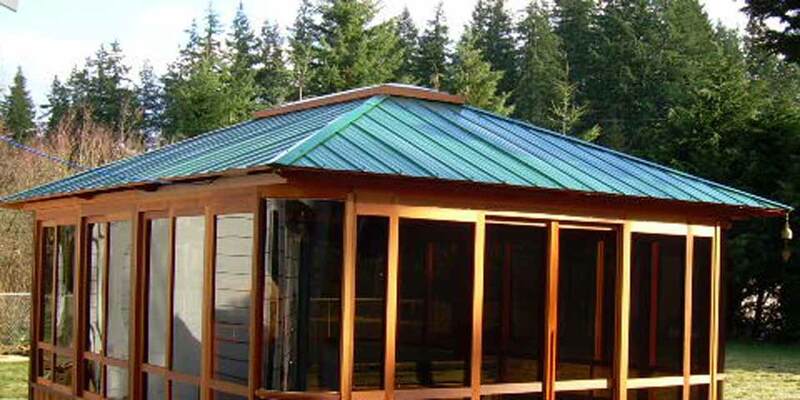 The Standard Steel Roof is a durable corrugated metal roof that is virtually maintenance free. 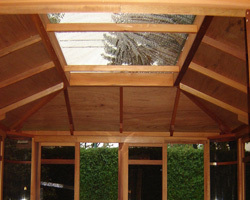 The Standard Steel roof is lined with mahogany plywood providing a clean finished interior ceiling appearance. 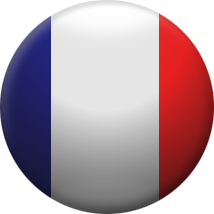 This roof is available in three colors, either Garden Green, Taupe Brown, or Terracotta Red. 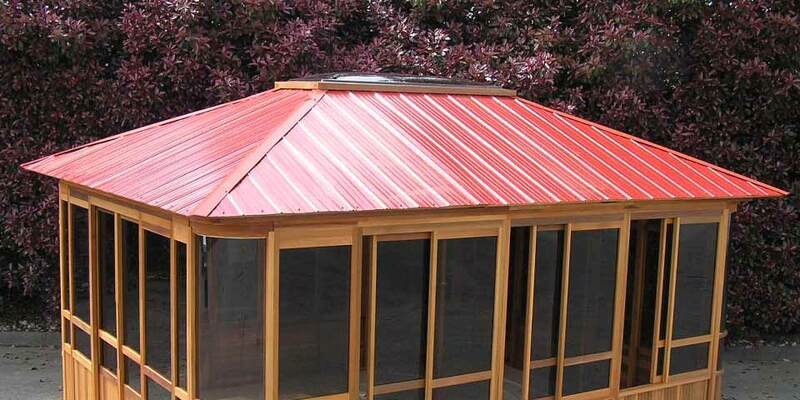 The Standard Steel Roof is available on the Olympia Gazebo Collection and the Escape 10x14. 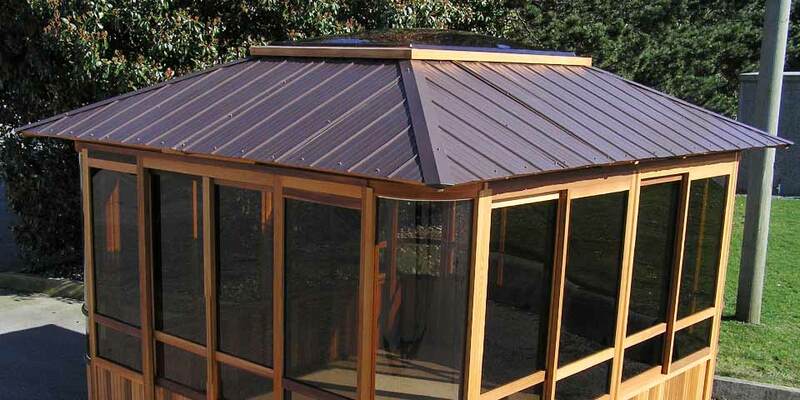 The Deluxe Metal Shake Roof is made of textured steel panels with a natural shake profile reinforced with 2x3 wood and double lined with mahogany plywood. 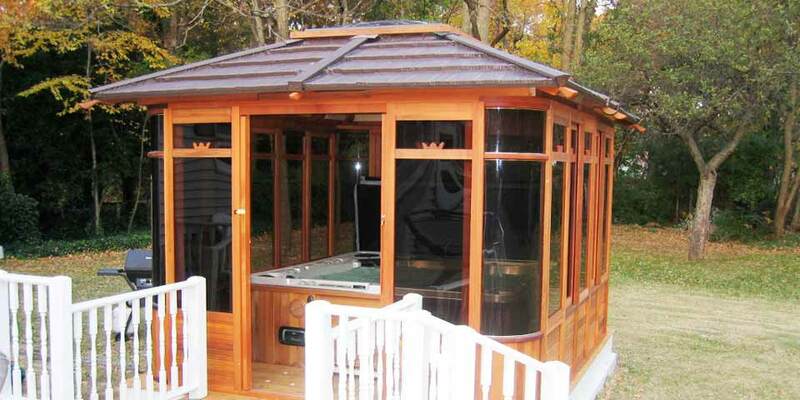 Each roof panel has an insulated air pocket to reduce noise from getting in or out of the hot tub enclosure. The textured steel panels have baked on enamel for extra durability and this type of metal shake is used on luxury homes in Canada and the USA. 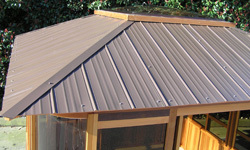 The Deluxe Metal Shake Roof is available in two colors, either Garden Green or Taupe Brown. 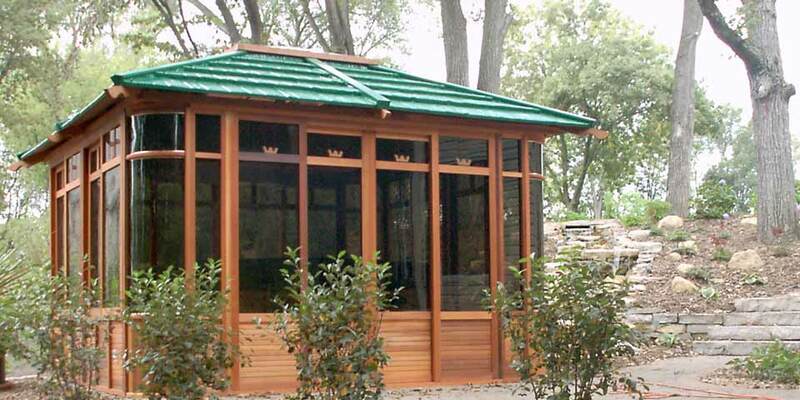 The Deluxe Metal Shake Roof is an optional upgrade for a fee and is only available on the Royal Gazebo Collection.